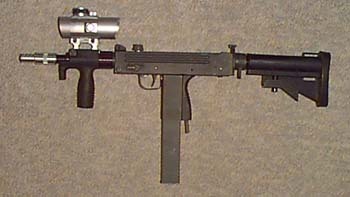 I have built my own "rate reduction system " for the MAC-11. Also I machined out a mp-5 grip so I could mount a 10 inch barrel "freefloating" and the comp I made and it has sten mag well extended mag release. Also machined the scope mount for it. This kit can be removed and the gun converted back in only a couple of minutes.